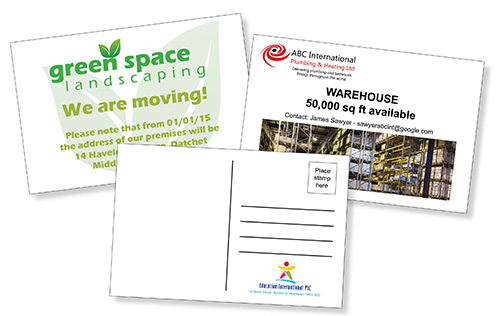 Postcards, A6 or A5, are an effective and direct way of communicating with clients and staff to promote products or services or keep them up to date with changes in the organisation. If required we can distribute postcards either to different organisation or home addresses. FAST – We can design postcards in a day or so and print in a few hours. LOCAL – We can visit your office – at short notice – to discuss your requirement. Free local delivery is part of our service - or you can collect from our centre in Clarence Street. We have a car park for customers’ use behind the centre.